Directed by Beth Pielert. 2006. 57 minutes. In English and Khmer with English subtitles. When I teach about the Khmer Rouge regime and its aftermath, something I have been doing for many years at the university level, I always assign first-person narratives as the primary reading material, both because I want to provide students with Khmer voices and because the individual stories are so powerful. Students can hardly believe that the stories are true; most of them have never even heard of the Cambodian genocide. Their U.S. history courses in high school barely cover the Vietnam War, and entirely skip its aftermath. 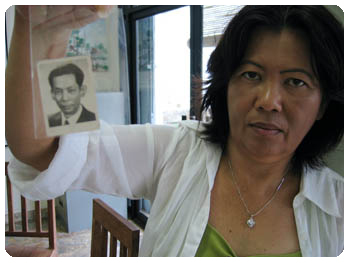 Thida Mam's narrative, co-authored with JoAn D. Criddle, To Destroy You is No Loss, begins with the evacuation of Phnom Penh and tells of Thida's family's hardships during the Khmer Rouge period (1975-1979). Her second book, also with Criddle, Bamboo and Butterflies, tells of the family's adjustment to life as refugees in the US. This film, Out of the Poison Tree, by filmmaker Beth Pielert, is the next step in this saga, the story of Thida and her sisters' return to Cambodia to find out what happened to their father, Buth Choun. They know that he was likely killed during the evacuation of Phnom Penh, when tens of thousands of others who were associated with the old regime were massacred, but they are not sure of the circumstances surrounding his death. The film is thus part of a particular genre of films on the Asian American experience that focus on cycles of return to the home country (another excellent film in this genre is New Year Baby about a young Khmer American woman who travels back to Cambodia with her parents). Out of the Poison Tree provides some historical background about the period, using interesting footage of the war years; but it is primarily a contemporary story as Thida and others of her generation seek to understand what happened thirty years ago ? now on the eve of the long-delayed Khmer Rouge Tribunal to prosecute the leaders for genocide. The film is an exploration of Cambodia today in the aftermath of the Khmer Rouge years, telling the individual stories of people who are �creators of justice after a great injustice has occurred. ?These include, in addition to Thida: Youk Chhang, the director of the Documentation Center of Cambodia (DCCAM); Aki Ra, an orphan raised by the Khmer Rouge who now does demining and runs a landmine museum; and Arun Sothea, who also lost his parents and now runs the Sovann Komar orphanage. By interweaving the story of Thida and her sisters with those of other survivors, the filmmaker does not allow us to simply wish for vengeance. Aki Ra, the deminer, tells us that he knows the people who killed his parents, but if he killed them, their children would seek vengeance on him, and his son on them, in an unending spiral of violence. Instead he demines, teaches others of the dangers of mines, and helps boys who have lost limbs to landmines, allowing them live with him while they go to school. The Khmer Rouge who raised him are still his friends, the only family that he ever knew. Arun Sothea, the orphan who runs an orphanage, says that after surviving the horrors of living imprisoned and seeing scenes of death all around, one must devote one's life to giving something back to society. The orphans he is raising now are not available for international adoption; he says that they too must give back to Cambodian society. But the most powerful dialogue in the film is with Youk Chhang, the director of DCCAM, the Documentation Center which gathers and preserves documents on the Cambodian genocide as evidence for the tribunal, but also so that the world will understand what happened in Cambodia. 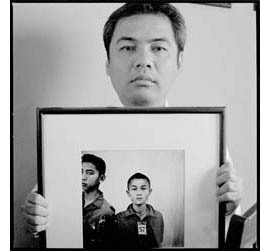 Chhang says that if Cambodians had learned about the Holocaust they might have tried to prevent what happened in their country. It can happen anywhere he tells us, in East Timor, in Burma... Providing us with the logic of first person narratives, he says, �It's personal. I am the judge. I am the victim. It's me. ?Here is the key message of the film: one seeks justice by searching for the truth. In the end, Thida and her sisters find the nightmare that they came seeking and learn the painful truth about what likely happened to their father. There is no easy resolution to the task they embarked on. But the movie provides an excellent exploration of the complexities of living with the legacy of the Khmer Rouge years. The cinematography is beautiful and the shots around the country provide a sweeping canvas on which to paint the story. The drawback to the 2006 version of the film is that it is already dated. When it was made, the tribunal had not yet begun and Khieu Samphan, Ieng Sary, and Nuon Chea had not yet been arrested. Now these three and two others are in jail awaiting trial. Beth Pielert plans to update the film with new information on the tribunal as it proceeds. Students could conduct on-line research on the latest status of the tribunal as part of the lesson plan for this unit, using the DCCAM website (www.dccam.org) and the tribunal website (www.cambodiatribunal.org). The latter includes video clips of the proceedings. I recommend the movie for teaching high school and university courses, in combination with the Criddle and Mam books, excerpted or in whole. Using them together allows students to get to know individuals and follow them through the story, and then 'meet' them in the film. Be sure to watch the film all the way through the epilogue, which includes music by Khmer rapper PraCh Ly. The epilogue gives you the contact information for DCCAM, the landmine museum, and the Sovann Komar orphanage. Students presented with the details of the Cambodian story often want to do something to help; teachers can organize fund raising projects to donate to these organizations. Judy Ledgerwood is a professor of Anthropology and Southeast Asian studies and department chair of Anthropology at Northern Illinois University. Her current research is focused on Cambodian Buddhism and ideas of cultural identity and she regularly offers workshops for educators on Cambodian history. Her latest publication, co-edited with Anne Hansen, is At the Edge of the Forest: Essays on Cambodia, History and Narrative in Honor of David Chandler (Cornell Southeast Asia Program 2008). New Year Baby. Directed by Socheata Poeuv. 2006. 74 minutes. The Flute Player. Directed by Jocelyn Glatzer. 2003. 53 minutes.